Polyptychs and other multipartite structures became less prevalent during the fifteenth century as painters moved toward unified pictorial formats. The change was motivated in part by the development of linear and aerial perspective, which enabled the convincing depiction of recession into depth. Painters were now able to enlarge pictorial space through illusionism rather than actual physical expansion. 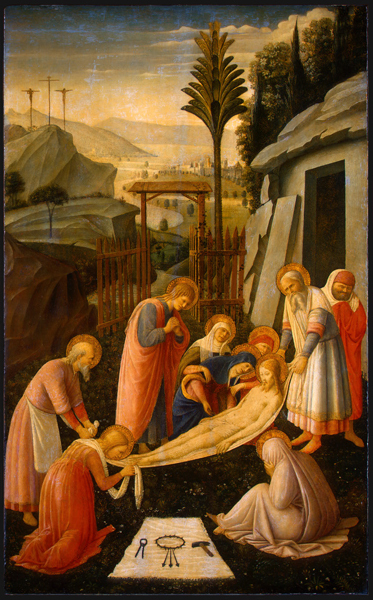 The Entombment of Christ, c. 1450, attributed to the Dominican painter Fra Angelico, focuses on a single, climactic episode: the burial of the crucified savior by a group of anguished mourners. The monoscenic narrative is enriched by allusions to earlier and later moments in the story, which are inserted into the expansive landscape setting rather than treated separately in side wings or predella panels. Christ’s suffering during the Passion is suggested by the crown of thorns and other instruments of torture set out conspicuously on a white cloth in the center foreground. The receding lines of the cloth direct our attention to an open gate in the middle distance, and beyond that to the hilltop site of the Crucifixion, where Christ’s vacant cross still stands. Other details foreshadow events to come. The rocky tomb at right anticipates not only Christ’s imminent burial but also his resurrection three days later, when the women who now weep over him will find the large stone again pushed aside and the tomb empty. By consolidating distinct episodes within a single, unified composition, the artist creates a sense of narrative flow that deepens our perception of the central scene. Unlike the often-confusing juxtapositions and spatial compressions found in medieval paintings, the orderly illusion of three-dimensionality in fifteenth-century paintings allows us to read them in a clear, sequential manner. 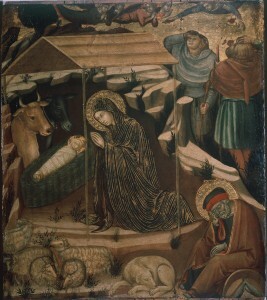 As noted above, the rocky enclosure set against a gold backdrop in Barnaba da Modena’s Adoration of the Child, c. 1380 crowds the figures into a shallow and spatially ambiguous setting. By contrast, in The Adoration of the Child, c. 1500, by Sandro Botticelli a stone backdrop crumbles away to reveal an airy, panoramic landscape. 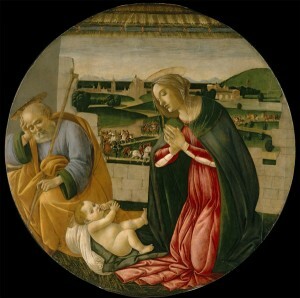 Botticelli used the enlarged pictorial space to expand his subject’s time frame. In the background a cavalcade of horses and riders winds its way from the remote distance toward the holy family in the foreground. Progressing incrementally through pictorial space, the procession conveys a sense of movement and elapsing time. It also foreshadows an episode in the story of Jesus’s Nativity, that of the Adoration of the Magi. As yet unaware of the destiny we see prefigured behind them, Mary and Joseph appear wholly absorbed in their own space and time, perfect examples of the sacred stillness of medieval art. Now, however, as the royal retinue draws ever nearer, the seemingly timeless communion of the holy family takes its place within a chronological sequence of passing moments (see “Getting inside the picture”).